I haven’t done anything all summer but work, read, and try to make sure my new car won’t quit on me while on the road. Luckily, my best friend (who has also been through much, much more this summer) wanted to put together a trip to Guntersville, Alabama. 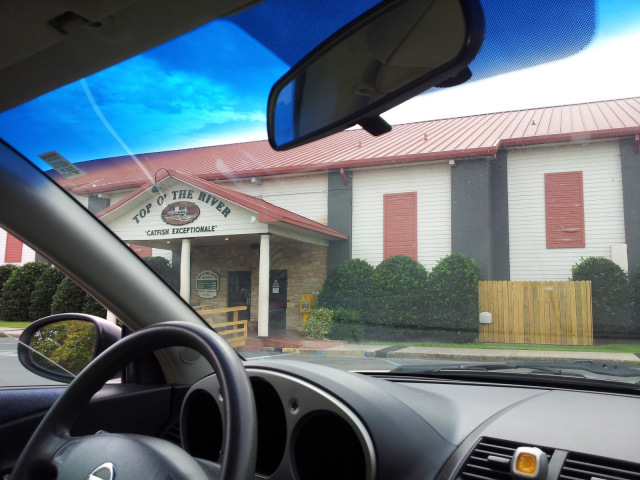 The plan: to eat at the famed catfish and seafood restaurant, Top O’ The River. It was a well-deserved trip from both ends, and was even better with her cousin coming along. This was my first time there–although in the past my mom repeatedly proposed how we needed to take the 45+ minute drive to do the same. She, my aunt and sister went a couple of weeks ago. Meanwhile, I stood in front of a register for eight hours on a beautiful Sunday (that's me being bitterly melodramatic). Nonetheless, I finally made it there Friday. And yes, I took the entire weekend off as a mini-vacation. Obviously, this picture didn't come out as majestic as it was while present. But I left it in the mix anyway. 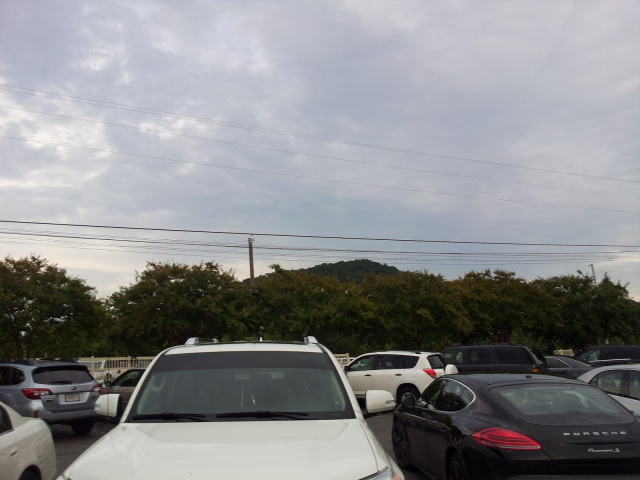 The mountains and river surrounding the small town of Guntersville is pretty cute. All you'll see is boats, canoes, and trucks; its a community that capitalizes on the surrounding river like it's nobody's business. For a split moment or two, I felt like I was in Cabet Cove. Their downtown is a hell of a lot livelier than ours–to be so small. And there appears to be only one way in and out of the town. All that aside, this is what the parking lot looked like after one blink. This is a bad pic of the restaurant. I'm no photographer, so pardon this. Nevertheless, there's a story here. The fact is the restaurant doesn't open until late in the afternoon. Apparently, it gets so busy that you have to be present and ready as the doors open to get a table. I snapped this picture quickly, and minutes before the lines started to form as the doors open. The building looks pretty small and average sized, right? Well, it's a whole different story inside. Not only is it two floors, but the restaurant's floor layout seems like it stretches over a mile. 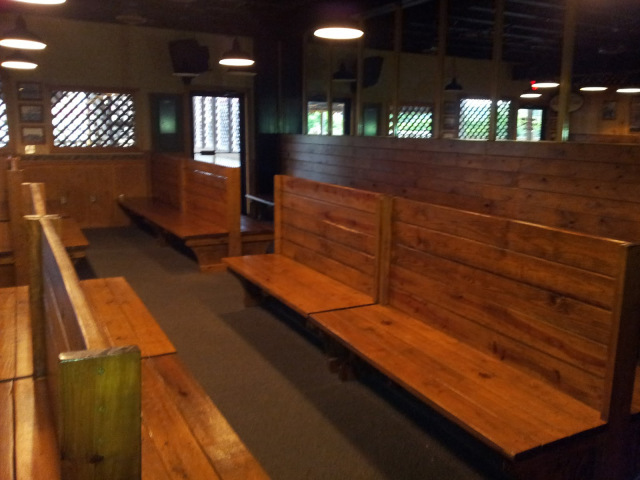 I loved their wooden booths because they were high-backed (or whatever you call them). This lended a little intimacy and privacy for me and my friends; further expressed as we pulled up the shades to gain a good view of the river the restaurant sits on. This is the waiting area, should there be no seating available. Lucky for us, we skipped this process. I can only imagine what this area looks like on a Sunday afternoon once church is out. The whole time we were there, I felt like this place had a system going. And that system started with the abundance of staff. Speaking of which, the service was certainly nice. I did enjoy our waitress, and am never one to be stingy with tipping. Now on to the catfish. I don't know anybody from the South who doesn't prize some good catfish. And Top O' the River certainly served. 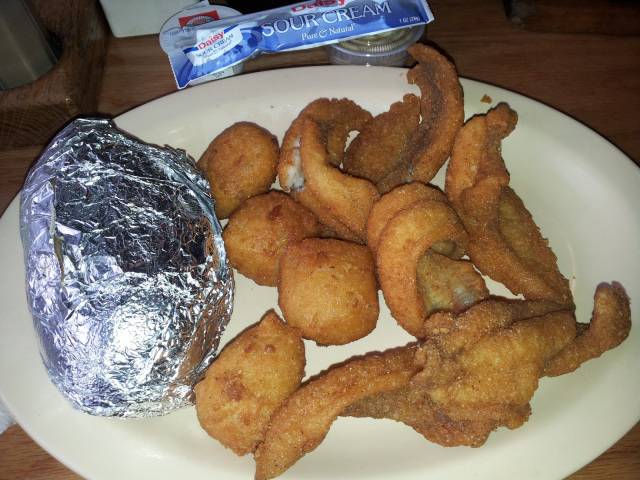 This plate is the River Special; catfish fillets, hush puppies, baked potatoes or fries. It was all delicious. What I loved about their catfish in particularly was how it wasn't filmy between the breading and the filet. That was a big, big plus. Instead, you cut right into steaming meat. Had I requested hot sauce (you know, because I am black), it probably would've took this to the next level. Instead, I settled with their homemade tartar sauce in absorption of their flavor. And it won. Everything you see here, I basically ate. Of course with the exception of the foil, potato skin, and half a hush puppies. Oh! I've never had pickled onions. To get your meal started, you're served a dish of these pickled onions, cole slaw, and cornbread. All of it amazing! The restaurant also serves steak, chicken strips, shrimp, and so forth. I had a great time and plan to go back with my family next weekend, as well as return with my friends in the fall. If you've ever been, share your experience in the comments.